Preschool children typically have boundless energy which when properly channeled, is a very good thing. As all parents know, it is best to keep young children occupied and entertained or they are likely to use all that energy to get themselves into trouble! Early on, kids begin to establish habits that they will carry with them throughout their lives, so smart parents and teachers encourage preschool kids to develop healthy attitudes about exercise and fitness. In the beginning, children do not need to be concerned about "fitness," but the focus should simply be on having fun. Many of the games that preschool children enjoy most are physical in nature, helping them to use their natural energy in pleasurable, constructive ways. Whether at home or in playgroups, indoors or out, parents and other caregivers should look for ways to keep kids moving. In this traditional children's game, kids sit in a circle with one child standing outside of the circle. The standing child goes around the circle, tapping the heads of friends saying "duck" to each child. Finally, the child chooses one child in the circle and says, "goose!" rather than duck, while tapping their head. The chosen child then gets up and runs around the circle of children, trying to tag the child who made the selection before that child is able to place herself into the vacant spot in the circle. The game continues, with each child taking a turn. A series of chairs is set up in a line, typically one less than the number of children playing. A parent plays music and instructs the kids to walk around the chairs until the music stops, after which the children should quickly find themselves a chair to sit on. Whichever child fails to locate a chair sits out and a chair is removed so that the game can continue in the same manner. Play continues until one child secures the last remaining chair. *A noncompetitive version of this game can be played by substituting hoops on the ground and then instructing the children to leap inside of a hoop (they can share space) every time the music stops. Children gather into a circle, either outdoors or in a large, open area. A lightweight ball (a beach ball works very well) is then tossed into the mix of children, who are supposed to try to keep the ball in the air for as long as possible. Children are usually happy to play this game repeatedly, attempting to improve the time that they can keep the ball going. Children take turns leading their friends through a series of movements (walking, skipping, running, hopping, etc.). This is fun for most children, especially when the leader chooses some silly moves for the group to imitate! Children use their bodies to form the shapes of letters and numbers, stretching and bending as needed. When several children work together to from the shapes, giggles are sure to follow! For most children, running and playing actively are as natural as breathing. While it can be tempting for parents to encourage their children to sit quietly (all of that noise and activity can be trying at times! ), it is far better to allow and even promote children's innate desire to move their bodies. Childhood obesity is at an all time high, but parents who provide their little ones with a healthy diet and plenty of opportunities for active play give them the best possible start. Active children are learning to love exercise, and that's a great lesson! 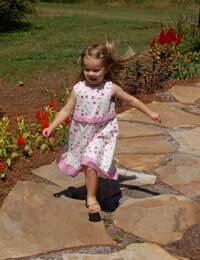 All those games are great, but kids also love just being able to run around a garden or a play area. When young, both girls and boys love kicking a ball around together. They're probably too young for catch, and bigger balls are easier for them to handle. In a play area, make sure they're well supervised so they don't try too much - there are usually swings and some other things that are specifically for young children. But always let them run a lot!